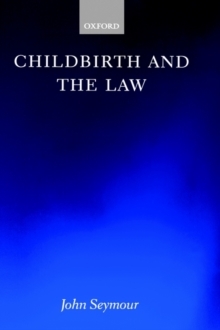 Childbirth and the Law examines aspects of English, United States, Canadian, and Australian law as it applies to the fetus, the pregnant woman, and the doctor or midwife who provides antenatal and perinatal care. A major part of the book consists of a critical examination of the law's attempts to protect the fetus, which is threatened by conduct such as a criminal assault, maternal drug-taking or parental refusal of medical treatment. The remainder of thework deals with the rapidly expanding and increasingly complex body of law on the liability of obstetricians, general practitioners, and midwives when negligent antenatal or perinatal care has been provided. There are numerous situations in which these health care professionals (or their employees) can beliable to pay damages. They can be sued if their negligence has harmed the mother, caused the birth of an injured, disabled, or stillborn child, or has resulted in the birth of an unwanted child. The book provides a comprehensive statement of the law on antenatal intervention to protect the fetus and on the responsibilities of those who care for pregnant women. By examining the nature of the relationship between a pregnant woman and her fetus, and the operation of child protection and criminallaws and the law of negligence John Seymour explores questions about maternal autonomy, the rights of the woman and the fetus, and the role of the law in protecting those rights and providing compensation when something goes wrong.